Draft: 2003, Oakland Athletics, 2nd rd. Attended Arizona State University, where his jersey No. 14 has been retired…earned All-American Honorable Mention honors in 2003 from Collegiate Baseball Insider…was named to the First-Team All-Pac-10 in 2002 and 2003…finished his career with a 23-game hitting streak…batted .371 with 113 runs, 27 doubles, seven triples, 14 home runs and 118 RBI in 116 games (115 starts). Spent the majority of the season on the disabled list with a broken right tibia, suffered on March 18 during a Spring Training game against Arizona when he fouled a ball off his leg...Began his minor league rehab on Aug. 25 and appeared in 11 games before being reinstated from the 60-day DL on Sept. 10...went 5-for-24 (.208) with a homer and two RBI in 16 games, including 12 pinch-hit appearances (4-for-11, .364, HR)…also appeared in four games (two starts) in left field... Selected to the Dodgers' NLDS and NLCS postseason roster, going 2-for-6 with a walk, two runs, a homer and an RBI in eight games as a pinch-hitter. Batted .294 with 20 doubles, 14 homers and 53 RBI in 142 games in his 10th season with Los Angeles…tied a career high with seven triples (also: 2006). ... Finished the season strong and was one of the NL's hottest hitters from July 29-conclusion of the season, ranking fourth in the league (min. 125 AB) with a .333 batting average (44-for-132) in 51 games…posted a .382 on-base percentage and a .553 slugging percentage in that span. ... Ranked 12th among National League qualifiers with a .306 batting average against right-handed pitchers (107-for- 350)…hit 18 of 20 doubles and all 14 home runs off righties…posted a .383 on-base percentage and a .517 slugging percentage against right-handers. ... Batted .313 (25-for-80) in close and late situations and hit .308 (57-for-185) with runners on base. ... Reached 300 career doubles on Sept. 26, becoming just the fourth LA Dodger to reach the mark, joining Steve Garvey (333), Willie Davis (321) and Eric Karros (302). ... Blasted his 12th-career walk-off home run in the 10th inning on Aug. 2 against the Angels…his 14 walk-off RBI ranks second in Los Angeles history behind only Dusty Baker (16)…also marked his 12th career multi-homer game (also homered in the 8th inning). ... Had the ninth-best batting average with two strikes in the NL (min. 100 PA), batting .249 48-for-193) with 24 walks. ... Appeared in all five of the Dodgers' postseason games, starting four in right field, and went 4-for-16 (.250) with a double and two RBI. Batted .272 with 12 homers and 52 RBI in 142 games for the Dodgers…led the team in doubles (33) and walks (61), and ranked among the club leaders in games played (2nd), hits (131, 2nd), home runs (T-4th) and RBI (T-3rd)... Turned the corner from June 6 on, batting .299 (87-for-291) with eight home runs, 24 doubles and 37 RBI in 86 games... Hit .294 (99-for-337) with nine of his 12 home runs against right-handers...posted a .394 on-base percentage against righties... Was one of the NL's best hitters on the road in 2013, posting the sixth-highest batting average (.311, 78-for-251) and the second-best on-base percentage (.406)... Tied for 13th in the NL with eight outfield assists and posted a .992 fielding pct., commiting just two errors in 1,141.0 innings…in the field, appeared in 54 games (50 starts) in right field, 74 games (70 starts) in center field and eight games (seven starts) in left field…had previously played just one game in center field in his Major League career, excluding the 2010 All-Star Game... Hit .293 with seven home runs and 31 RBI with a .384 on-base percentage in 74 games as a center fielder... Batted .310 (9-for-29) during his season-long eight-game hitting streak that stretched from April 1-11... Missed 14 of the Dodgers' last 15 games with a left ankle injury... Was limited to a pinch-hitting role in NLDS against Atlanta and went 0-for-3 with a walk in four games; started five games in the LCS and pinch hit in Game 2 against St. Louis...went 3-for-20 in the series. Selected as the Dodger nominee for the Hank Aaron Award after leading the club in runs (79), hits (158), doubles (36) and RBI (89) in a team-high 149 games in his seventh Major League season. Ranked second on the club with 20 homers, his fourth season with 20 or more homers in his last five campaigns. Tied for 14th in the NL with 36 doubles as he reached the 30-double mark for the sixth consecutive year, becoming the first Dodger in franchise history to do so...only four others in team history have six 30-double seasons (though not in a row): Steve Garvey (1974-76, 78-79, 82), Jackie Robinson (1947-51, 53), Dixie Walker (1940-41, 43-45, 47) and Zack Wheat (1910, 16, 21, 24-26). Broke Ron Cey's 35-year-old Los Angeles Dodger franchise record with 10 consecutive hits from Aug. 22-25 and tied the franchise record set by Brooklyn Robin Edward Konetchy on June 28-July 1, 1919...recorded two consecutive four-hit games on Aug. 24-25, marking the first time the feat has been accomplished by a Dodger since Manny Ramirez did it on Aug. 29-30, 2008. Was a finalist for the NL Rawlings Gold Glove Award. Had a streak of 282 games (276 starts) without an error (July 9, 2010-July 26, 2012), which was the second-longest active run among non-pitchers in baseball behind only Franklin Gutierrez...it was the second-longest errorless run by a Dodger outfielder behind only Brett Butler's 306-game run from 1992-94. Led the NL with a .325 batting average (109-for-335) against right-handers and hit 16 of his 20 homers against righties. Ranked 19th in the NL with 89 RBI, the second-highest single-season total of his career (106 RBI, 2009). Reached 1,000 career hits with his second-inning solo homer on Sept. 4...played in his 1,000th career game on Sept. 30 against Colorado. Drew a game-winning bases-loaded walk on April 13 against the Padres for the 12th walk-off RBI of his career. Batted .368 with the bases loaded (7-for-19), including his fourth career grand slam on June 10 off Seattle's Blake Beavan. Hit .313 with runners in scoring position (45-for-144), tying for the 16th best mark in the NL, and batted .335 with runners on base (84-for-251), which was the eighth-best mark in the NL. Batted .331 (91-for-275) in 74 games at Dodger Stadium, the sixth highest home batting average in the NL...hit 14 of his 20 homers at home. Missed 11 games from June 28-July 13 with a mild left oblique strain...was ejected for the second time in his career on May 13. Earned his second consecutive All-Star selection and posted the second-longest hitting streak in franchise history with a 30-game run in an injury-shortened season...batted .292 with 30 doubles, 11 homers and 62 RBI in 135 games...Received his first career Rawlings Gold Glove Award, earning the nod as the top fielding National League right fielder...tied for 15th in the NL with eight outfield assists and played 1,091.1 innings in the field without committing an error...had the third-most errorless innings played in the outfield in a single season in team history behind Brett Butler's 1991 (1,409.0 innings) and 1993 (1,381.2 innings) seasons...Ranked third in the National League with a .321 batting average against right-handed pitchers (111-for-346)...hit 10 of his 11 homers against right-handers...Batted .288 (36-for-125) with runners in scoring position and went 6-for-9 with the bases loaded, including his third career grand slam on Aug. 30 against the Padres...Batted .397 (46-for-116) during his 30-game hitting streak from April 2-May 6, which was the second-longest run in the Majors and the second-longest hitting streak in Dodger history behind only Willie Davis' 31-game streak from Aug. 1-Sept. 3, 1969...By hitting safely in his last 26 April games, he established a new Major League record for the longest hitting streak during the month of April, having passed Joe Torre's 22-game streak from April 1971...with 40 hits in 27 games, Ethier tied the Dodger franchise record for most hits in April, which he now shares with Rafael Furcal (2008) and Mike Piazza (1996)...Even after the hitting streak was snapped, Ethier continued his stretch of reaching base safely until May 15 with his 37-game streak ranking as the fifth longest in Los Angeles Dodger history...Hit the 100th home run of his career on April 20, becoming the 24th player in franchise history and the 15th Los Angeles Dodger to reach the century mark...Hit .304 (77-for-253) in 68 home games, which was the second-best mark on the club and the 19th-highest home batting average in the NL...Ranked 16th in the NL with a .328 batting average (19-for-58) in 15 Interleague games...Ranked second on the club with 30 doubles...posted 30 or more doubles in five straight seasons, becoming just the second Dodger to do so (Jackie Robinson, 1947-51)...Earned his second consecutive All-Star selection in his hometown of Phoenix and stroked a pinch-hit RBI single in his only at-bat in the fifth inning...became the first Dodger outfielder with consecutive All-Star selections since Gary Sheffield from 1998-2000...ranked 12th in the NL with a .311 batting average at the All-Star break...Had 12 games with three or more hits, which tied for the 15th most in the NL...since 2008, he is tied for fifth in the NL with 56 games with more than three hits...Underwent season-ending right knee surgery on Sept. 14...the arthroscopic procedure to smooth the underside of his kneecap and remove loose bodies was performed by Dr. Neal ElAttrache. Hit .292 with 23 homers, 82 RBI and 33 doubles ... Led the Dodgers in slugging percentage with a .493 mark, walks with 59 and multi-hit gameswith 43 ... Finished second on the Dodgers in home runs, doubles, hits (151), extra-base hits (57) andruns (71) ... Among qualifying players, led Los Angeles with a .363 on-base percentage ... Led the team with 59 walks, including a team-high 11 intentional passes ... walked four times on Sept.17 to tie his career high, which occurred previously on Aug. 7, 2009 vs. Atlanta ... Voted in by the fans to start for the National League All-Stars ... was his first-ever All-Star appearance ... started in center field and went 1-for-2 in the contest, the NationalLeague's first win since 1996 ... was the Dodgers' first startingoutfielder since Darryl Strawberry in 1991 ... Batted .318 vs. right-handers, which ranked fourth in the NationalLeague ... his .328 average at night ranked second in the NL ... Hit .306 at Dodger Stadium and .326 with runners on base ... Hit .329 with six homers and 19 RBI in April ... along with Matt Kemp,was named the Farmers Insurance Co-Player of the Month ... Hit his first career grand slam in the second inning on April 16 vs. SanFrancisco and followed it up with a walk-off grand slam on May 6 ... hasa Major League-leading 11 walk-off hits since 2008 and six walk-offhome runs in his career...collected a season-high five RBI on April 16 ... Had two multi-homer games (April 16 and May 2) in 2010 and nowhas 10 in his career ... Had a season-long nine-game hit streak from April 29-May 8, batting .514 (18-for-35) with four doubles, five homers and 15 RBIin that span ... Missed 15 games from May 15-31 with a fractured right pinky finger ... At the time of his injury, was a Triple Crown candidate as he led the NL with a .392 batting average and 38 RBI while his 11homers tied for the NL lead ... Was hitting .453 (29-for-64) at home and .500 (19-for-38) with runners in scoring position before the injury ... In his 13 games during May, batted .453 (24-for-53) with five homers and 19 RBI ... At the All-Star break, ranked second in the NL with a .324 batting average and ranked fifth with a .553 slugging percentage ... ranked 12th with a .379 on-base percentage ... had 14 homers and 54 RBI ... Also led the National League with a .363 average at night during the first half ... Went 4-for-4 on Aug. 10 at Philadelphia and again on Oct. 2 vs. Arizona ... those were the seventh and eighth times in his careerthat he collected four or more hits ... The Dodgers were 15-6 when he homered ... Batted .305 (32-for-105) with nine doubles, four homers and 12 RBI in 27 August games ... Was ejected on Aug. 26 at Milwaukee for the first time in his career for arguing balls and strikes ... Reached base safely in his last eight plate appearances of the season (6-for-6, BB, HBP) ... Made just one error in 230 chances in right field ... recorded six outfield assists ... Was tied for second among outfielders and led all NL right fielders with a .996 fielding percentage ... Missed the Dodgers' July 31 game at San Francisco to return to Los Angeles and witness the birth of his second son, Retton. Followed a successful rookie campaign with a strong sophomore season in which he appeared in 153 games, the second-highest total on the team...set career highs in nearly every offensive category, playing 60 games in left field and 102 games in right field...notched a career-high 32 doubles, tying him for second on the team with Russell Martin...during his first two full seasons, registered 52 doubles, the third-highest total in Los Angeles Dodger history behind Martin (58) and Eric Karros (57)...tied for sixth in the NL with 10 outfield assists and made just one error in 60 games in left field...hit 10 or more homers in each of his first two seasons in the Major Leagues, joining Russell Martin as the first Dodgers to accomplish that feat since Jim Lefebvre (1965-66)...after a slow start, batted .291 with 10 homers and 53 RBI from May 1 through the end of the season...batted .320 (41-for-128) during day games...had a torrid July, batting .383 for the seventh-highest average in the National League...added 14 RBI during the month...during a six-week span from June 20-Aug. 1, batted .372 (45-for-121) in 45 games...As a pinch-hitter, went 5-for-10 with two homers and five RBI...tied the game at 1-1 in the eighth inning on May 27 with his first-career pinch-hit home run...cracked a pinch-hit three run homer in the ninth inning on Sept. 6 at Wrigley Field, propelling the Dodgers to a come-from-behind 7-4 victory...slugged a game-winning, two-run homer in the eighth inning on June 3 at Pittsburgh after the Dodgers erased a five-run lead...hit .323 in the No. 8 slot in the order, where he had 124 of his 447 at-bats...hit .302 (16-for-53) with two doubles and five RBI during his second Spring Training at Vero Beach. Began the season in Triple-A Las Vegas after being acquired from Oakland in exchange for Milton Bradley and Antonio Perez on Dec. 13, 2005...Was recalled from Triple-A Las Vegas on May 2 in place of the injured Ricky Ledee and made his Major League debut on May 2 in left field before his hometown crowd at Arizona...tallied his first Major League hit in the game, a double off Luis Vizcaino...Established himself as one of the top N.L. Rookie of the Year candidates, ranking among rookie leaders in batting average (.308, 3rd), on-base percentage (.365, 3rd), slugging percentage (.477, 7th), hits (122, 10th), multi-hit games (33, 10th), triples (7, T-2nd) and outfield assists (8, 1st)...Ranked third among all Major League rookies with a .308 average...From May 19 - Sept. 2 batted .348, the best average in the NL and third-best average in the Majors behind Joe Mauer (.368) and Justin Morneau (.353) among players with more than 200 plate apperances...Had a 16-game hitting streak from July 26-Aug. 12, tying him for the third-longest by an L.A. Dodger rookie with Steve Sax...Tommy Davis holds the record with a 20-game streak in 1960...Made 99 starts in left field and the Dodgers were 55-44 in those games...Made just six errors in the field and led Dodger outfielders with eight assists...At Dodger Stadium, batted .337 (64-for-190)...Batted .351 (27-for-77) vs. left-handed pitchers...Hit .324 (23-for-71) with four homers, 14 RBI, and a .395 on-base percentage in May...batted .344 (22-for-64) in the month of June with a .368 on-base percentage...Named NL Player of the Week for July 3-9 when he batted .500 (11-for-22) with a homer, a triple, two doubles, four runs scored, two stolen bases, and 10 RBI in seven games...in the month of July batted .362 with five homers and 18 RBI to earn the Dodgers' 3-Day Blinds Player of the Month Award...At the All-Star Break, led NL rookies in batting average (.352), on-base percentage (.403) and slugging percentage (.545)...was 10th in hits (58) and tied for ninth in total bases (90)...Ripped his first Major League homer with two-out in the ninth inning off San Diego reliever Dewon Brazelton on May 3...Had his first career multi-homer game on July 24 vs. San Diego...Went 5-for-5 with a homer, sacrifice fly, three RBI and a Dodger season-high four runs scored on May 19 vs. the Angels...it was one of two five-hit games for the Dodgers on the season and the first by a Dodger since July 5, 2005 when Oscar Robles accomplished the feat at Colorado...Batted .349 with one homer, 12 RBI, a .447 OBP and .500 SLG in 25 games for the 51s while playing primarily right field prior to being called up to the Dodgers...Batted .276 (8-for-29) with a homer and 7 RBI in 15 games during Spring Training...While the team was in Washington, D.C., visited U.S. military veterans at Walter Reed Army Medical Center. Named Texas League Player of the Year at Double-A Midland, batting .319 with career highs in runs (104), doubles (30), homers (18) and RBI (80) ... Was named as the best batting prospect in the Texas League by Baseball America...the magazine also rated him as the fourth-best prospect in the Oakland farm system prior to the trade ... The A's tabbed him as their organization's Position Player of the Year for 2005 ... Earned Texas League All-Star honors and captured the MVP Award in the All-Star Game ... Played for the Phoenix Desert Dogs in the Arizona Fall League after the season and led the AFL with a .495 on-base percentage while finishing eighth with a .366 batting average ... Had two homers and 21 RBI in 23 games for Phoenix while posting a .598 slugging percentage ... Helped his teams to the Texas League Championship and Arizona Fall League title ... Was honored with the Dernell Stenson Sportsmanship Award in the AFL, which goes to the player who brings "the characteristics that Stenson brought to the ballpark everyday: a solid work ethic, great sportsmanship and a humble personality" ... Was batting .402 as late as May 11...hit .378 in April, .350 in May and .322 in August for Midland ... Was promoted to Triple-A Sacramento on Sept. 2 and appeared in four games for the Rivercats, going 4-for-15 with two RBI ... Appeared in 69 games in left field, 13 in center field and 47 in right field ... Attended MLB's Rookie Development Program in January 2006 in Phoenix, AZ. Hit .313 with seven homers and 53 RBI for Single-A Modesto in his second professional season ... His .313 average ranked eighth in the California League ... Had his season shortened by a stress fracture in his back, limiting him to just 99 games ... Appeared in 20 games in left field, 77 games in center field and six games in right field. In his first professional season, split time between Single-A Vancouver and Single-A Kane County ... Tore up the Northwest League, batting .390 in 41 at-bats for Vancouver prior to his promotion ... Batted .272 in 40 games for Kane County from July 17 through the end of the season. November 4, 2017 RF Andre Ethier elected free agency. September 1, 2017 Los Angeles Dodgers activated RF Andre Ethier from the 60-day disabled list. 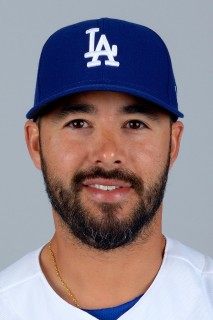 August 24, 2017 Los Angeles Dodgers sent LF Andre Ethier on a rehab assignment to Oklahoma City Dodgers. August 18, 2017 Los Angeles Dodgers sent RF Andre Ethier on a rehab assignment to Tulsa Drillers. August 12, 2017 Los Angeles Dodgers sent RF Andre Ethier on a rehab assignment to Rancho Cucamonga Quakes. May 9, 2017 Los Angeles Dodgers transferred RF Andre Ethier from the 10-day disabled list to the 60-day disabled list. Lumbar disk herniation. April 2, 2017 Los Angeles Dodgers placed RF Andre Ethier on the 10-day disabled list retroactive to March 30, 2017. Lumbar disk herniation. September 10, 2016 Los Angeles Dodgers activated RF Andre Ethier from the 60-day disabled list. August 25, 2016 Los Angeles Dodgers sent OF Andre Ethier on a rehab assignment to Rancho Cucamonga Quakes. July 13, 2012 Los Angeles Dodgers activated RF Andre Ethier from the 15-day disabled list. July 11, 2012 sent OF Andre Ethier on a rehab assignment to Rancho Cucamonga Quakes. July 4, 2012 Los Angeles Dodgers placed RF Andre Ethier on the 15-day disabled list retroactive to June 28, 2012. Strained left oblique. May 31, 2010 Los Angeles Dodgers activated RF Andre Ethier from the 15-day disabled list. May 28, 2010 sent RF Andre Ethier on a rehab assignment to Albuquerque Isotopes. May 18, 2010 Los Angeles Dodgers placed RF Andre Ethier on the 15-day disabled list retroactive to May 15, 2010. Fractured right pinky finger.